The Dutch West India Company needs YOU. As one of a few prominent "patroons" responsible for the destiny of the expanding Dutch settlement of New Amsterdam in 1620s America, you must ensure that a steady stream of valuable furs travels from the forests of the new world back to the insatiable marketplaces of Europe. The forests teem with beaver, mink, otter, muskrat and lynx; your job is to get your hands on those furs, then to get them aboard ships heading back across the Atlantic to earn rich rewards. To succeed, you will have to harness the burgeoning farmlands, compete for mastery of the bustling city, and engage with the skilled native fur trappers as their hunting grounds dwindle. 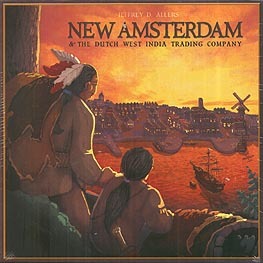 If you can manage to be the patroon that keeps the best profits flowing steadily into the Company's coffers, you will be decreed Director-General of the Netherlands' colonial crown jewel... New Amsterdam!